We put a ton of time into that cappuccino blend! I’m glad you like it! We are using 15mL glass bottles, and 4oz PET bottles. We are looking to add more flavors in the next couple weeks from FA CAP and RealFlavors!! Buy any 5 15mL TFA Flavors concentrates and get 1 FREE!! All of our 15mL TFA Flavor Extracts come in Glass Boston Round Bottles! We went ahead and added an Imported VG to our website! It is a lot less expensive than our made in the USA VG and we wanted to give everyone a choice on which one they like better! Also, here are our latest deals! All of our TFA flavors are on sale! 15mL TFA flavors come in 1/2 oz glass boston round bottles for only $1.79! Buy any 5 TFA flavors and get 1 Free! Also, save an additional 10% off when adding these flavors onto one of our DIY E Juice Kits! Check out our new DIY E-Liquid Kit! Everything you need for less! What could we add to this kit to make it better? Let us know! Just had a quick look and without commenting on the flavour list - i think you should offer an option to increase the vg and decrease the pg buying 50/50 is not always optimal you could offer 400 vg 100 pg options as an example. Great idea!! I will get our web developer to start working on it! We added some new options! Let me know what you guys think! Just got around today to opening the nic I received on from LNW on 2/25/17. 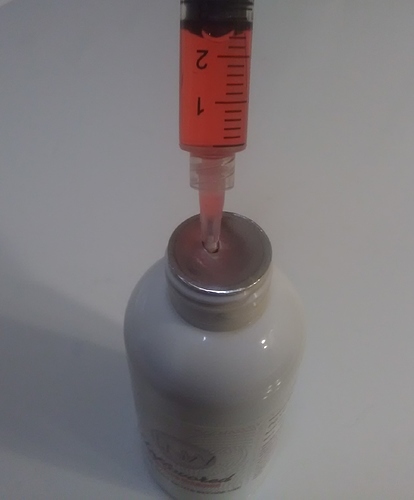 I haven’t tested it in any mixes yet but is this pinkish color normal? The nic bottle was unopened until today and was stored immediately after I received it in a closet shelf in my basement that stays around 68F. I used a brand new out of the wrapper syringe for drawing the nic out of the bottle. I know that some discoloration of nic liquid is normal and does not affect flavor but just wanted to make sure this was OK.
And I won’t be using this company now. Pink nic base is fairly common and will usually taste and vape fine. It may have just been exposed to some nitrogen during the manufacturing process (see the bottom of this Carolina Xtracts FAQ). Mix it up without any flavorings. If it smells and tastes fine, it is fine. We did have one of our batches of nicotine oxidize to a pink color. The color of oxidation does not effect the quality of the nicotine. We know this color seems a little strange, but we assure you the quality is still top notch. The color should not in any way effect your finished product. This oxidation seems to occur when the pure nicotine is exposed to nitrogen before it is exposed to oxygen. I hope this helps! There is a ton of information online about it if you google it. But I assure you that this nicotine’s quality is not effected by the color of its oxidation. Thank you for that link! I hadn’t seen that until now. No problem. I have a 120ml bottle of nic base sitting in my freezer from you guys that I picked up when you had it for $9.99 with the coupon code you posted here about a week ago. I haven’t mixed with it yet but will as soon as I finish the bottle of Liquid Barn nic base I’ve been using and am nearly finished with. I’m curious how it compares as the price is certainly comparable to LB nic. I will be sure to post the results here when I do.